I tried out NIVEA Skin Firming & Toning Gel-Cream and wound up giving it 2 out of 5 stars. There are some things I like about this cellulite product but also quite a few drawbacks. I’m actually happy with the results it produces. It only took about 2 weeks for me to start noticing firmer, tighter skin. The price is hard to beat because it’s super affordable and you get a pretty good amount of product. And the squeezable bottle makes it easier to dispense and apply to your skin. But I have a number of problems with this cellulite product. One of my biggest issues is the smell! The scent is SO overpowering and will likely give you a headache if you’re sensitive to strong smells. It smells yucky like menthol and mouthwash and the smell carries with you for a few hours. The product is a lightweight gel-cream and it applies pretty nicely but it has a major flaw…. it’s STICKY. I found my hand sticking to my leg sometimes even 2 hours after applying it. The gel portion of this product is the culprit to the highly annoying stickiness. Also, even though I was happy with the results, I was surprised at how dried out my skin was. This product doesn’t hydrate or moisturize in the least, which is a big bummer because my skin didn’t feel as healthy or supple. 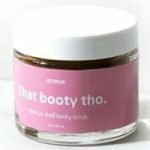 So overall, this is a super affordable cellulite product that can give you some decent results if you can get past the strong smell, stickiness, and dryness. 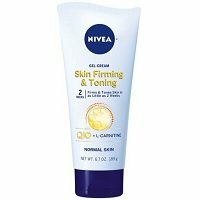 NIVEA Skin Firming & Toning Gel-Cream is a blue colored, pliable, jelly-like consistency. It’s a cross between a gel and cream, so it’s slick and cold but is thicker in texture, like that of a true cream. This product goes on like you would any type of body lotion. It comes in a squeeze tube, which I like. You’re going to apply the gel-cream twice daily to your thighs, booty, and stomach. Apply less than you’d think at first because there were many times I just squeezed and slathered and it was a sticky mess! After you apply, rub in until it’s absorbed. The big downfall is that this product is sticky and cold, more like a typical gel product. So it feels much slicker and sticky on the skin. The gel-cream feels lightweight on the skin and only takes about 5 – 10 minutes to fully dry. HOWEVER, the product stays SO STICKY for up to 2+ hours after drying. Like you put your hand on your leg and it sticks when you try to pull it away. That’s a huge pet peeve of mine. YUCK! This smell is so overwhelming and powerful in the bottle. It smells like a concoction of medicated ointment, menthol, and Listerine mouthwash. I don’t like it one bit! And a ton of other users have this complaint, as well. It’s a tough smell to get past. Unfortunately, the powerful smell follows you around throughout the day. I could smell it wafting up as I walked around and went about my day. It definitely clashed with my other scents and perfumes. And just the fact you can smell it on your skin as is was tough to get past. It takes a few hours before it starts to fade away completely. The short term results were pretty decent. The bottle says that this product firms & tones skin in as little as 2 weeks. I’d saw it took just about over 2 weeks to see some results. My skin did appear a bit more firm and toned. But my skin was really dried out and wasn’t soft. Which was odd because most cellulite products hydrate the skin very well. Long term, my skin continued to feel tight and felt a bit firmer. Problem areas like my booty and thighs looked more smoothed out. So my cellulite looked a little less obvious and I was happy with that aspect. However, my skin still felt really dried out and tight. It looked better but it didn’t feel nourished or hydrated in the least, which is something that’s crucial for combating cellulite. NIVEA Skin Firming & Toning Gel-Cream has 16 ingredients and unfortunately a lot of them are impossible to pronounce and I have no idea what they are. So this product loses points from me there. I’ll list the full line up of ingredients at the bottom. This isn’t a “natural” product in the least and uses artificial colors and fragrance. It also recommends that it’s for “normal skin”, so I’d be careful if you have sensitive skin. But let’s go over the notable ingredients. First up is Co-Enzyme Q10, also known as CoQ10. It’s actually a compound that’s naturally found in the body and has a wide variety of health benefits and functions. Natural CoQ10 in our body functions to help generate energy in our cells. There are high concentrations of this substance in our organs with the most energy demands like our heart, liver, lungs, and kidneys. It also acts as an antioxidant to protect our cells from harmful oxidative damage and free radicals. However, as we get older, our natural CoQ10 levels decline. Its been shown that applying Co-Enzyme Q10 directly to the skin may help boost energy production in your skin cells and increase antioxidant protection. Applying CoQ10 to the skin is also believed to help diminish oxidative damage caused by UV rays and has been shown to help lessen the depth and appearance of wrinkles. The second active ingredient is L-Carnitine. L-Carnitine is a natural component in metabolism that works to increase energy burn and in turn promote weight loss and reduce the appearance of cellulite. On paper the science is sound but as of right now there aren’t any proven studies to support this theory fully. Lotus Extract is the third active ingredient. Lotus contains a high amount of antioxidants, vitamins (like vitamin C, A, B complex) and minerals that act as a natural moisturizer and help brighten complexion and nourish skin. This natural extract helps control oil production, hydrates the skin, and may improve elasticity. It also soothes inflammation. All of which may help decrease the appearance of cellulite. Here is the full list of ingredients: Water, Alcohol Denat., Glycerin, Dimethicone, Carnitine, Nelumbo Nucifera Leaf Extract, Ubiquinone, Glyceryl Glucoside, Chondrus Crispus Extract, Butylene Glycol, Acrylates/C10-30 Alkyl Acrylate Crosspolymer, Sodium Polyacrylate, Fragrance, Sodium Hydroxide, Phenoxyethanol, Blue 1. You can buy this cellulite product from Walmart or Amazon. I personally got it from Amazon, but it’s currently the same price at both websites. You get a 6.7 oz tube (that lasts about a month or so) and it costs $10.89. So it winds up being $1.62 per oz of product. That’s incredibly reasonable in price. It’s probably one of the cheapest cellulite products I’ve seen. I love the affordable price tag but you definitely don’t get a perfect product. This is such a bummer! But you don’t actually buy the product from their website. It directs you to buy it online from Walmart or Amazon. So there’s a chance that these two companies have some kind of guarantee in place or at least a return policy of some sort. Luckily the product isn’t super expensive, but I still want to see a guarantee somewhere to product the customer. To buy NIVEA Skin Firming & Toning Gel-Cream, click here. Drying Time Takes about 5 – 10 minutes to dry but stays SUPER sticky for hours after! Smell (In Bottle) Overwhelming! Medicated, menthol type smell. I don’t like it! Smell (After) Powerful smell lasts for a few hours then begins to fade. It’s overpowering and you can smell it wherever you go. Long Term Results Cellulite & skin tone improved somewhat but skin continued to feel tight and dried out. Not a nourishing or hydrating product. Price A 6.7 oz tube is $10.89, $1.62 per oz.